At school in Bathurst he set up his easel at the back of the classroom and drew views through the window. 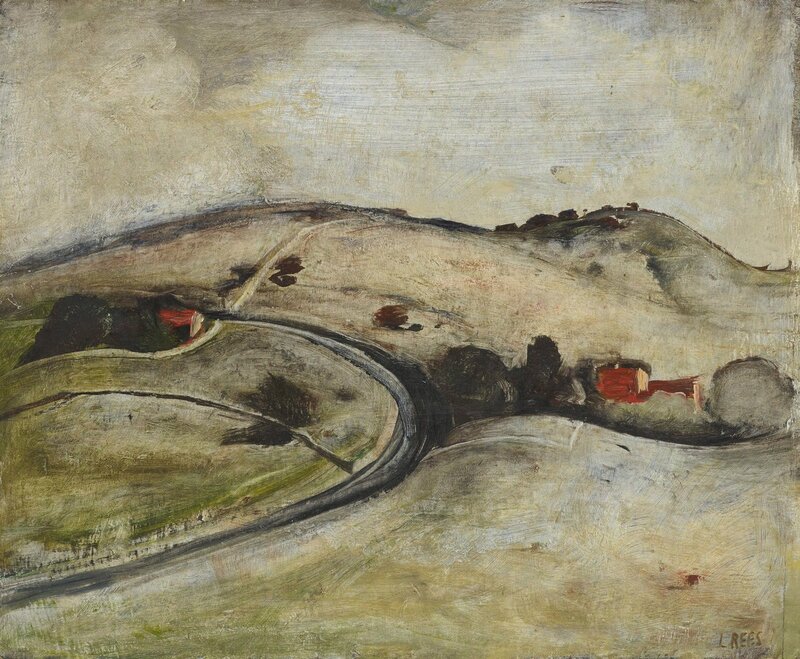 The soft hills and fields of surrounding countryside were indelibly embedded in his repertoire of images and fed his imagination over many years. 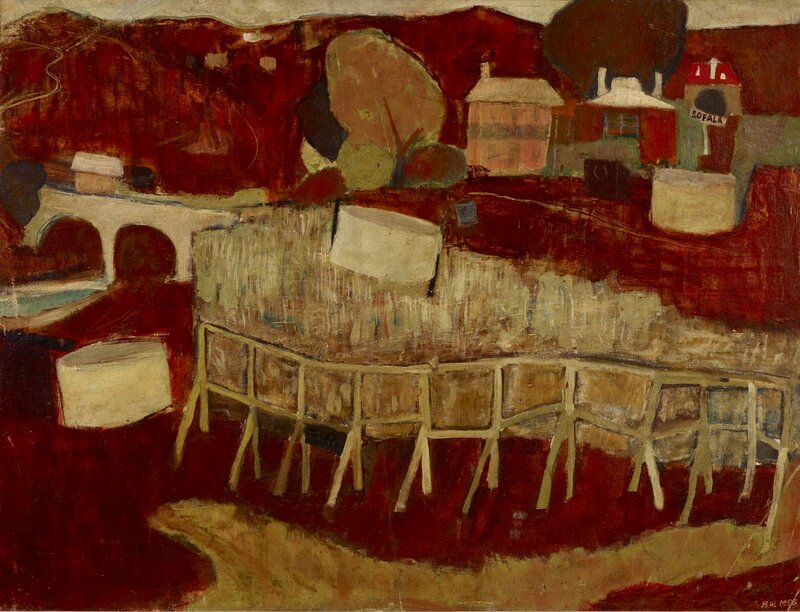 Whiteley was influenced by the landscapes around him – the country towns of Hill End, Sofala and Bathurst, not to mention the streets and buildings of Sydney, where he lived and worked. Their shapes, textures and colours remained prevalent in his work, even after he left Australia for Europe at the beginning of 1960. Abstraction for Brett was more about learning how to deal with aesthetics and emotion together to come up with something that was a unique vision. He learnt a lot from abstraction about how to bang one form up against another … it didn’t really matter what it was, whether it was figurative or abstract; the important thing was not to leave the canvas empty. 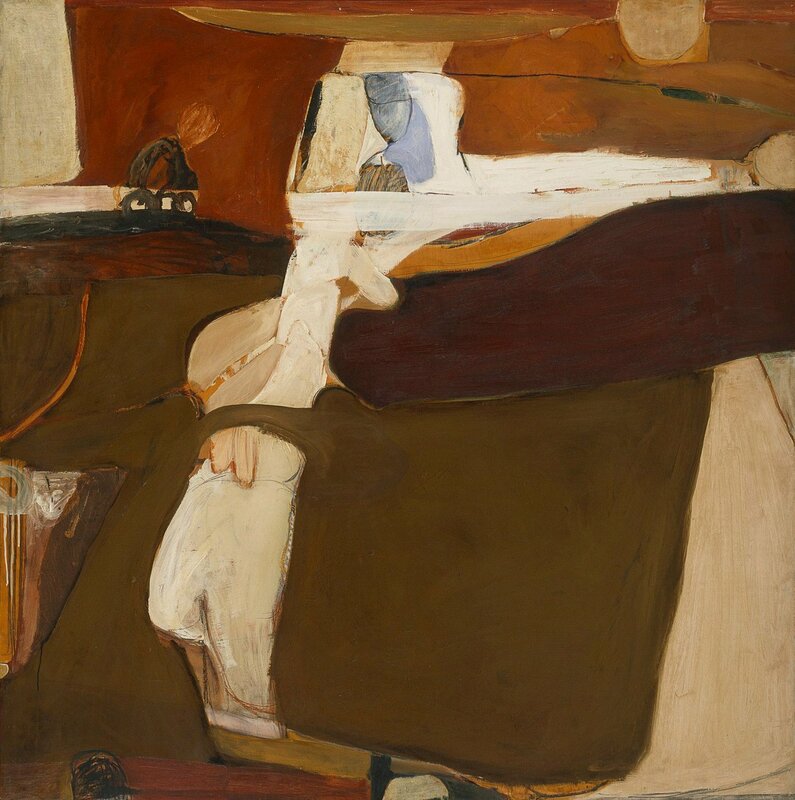 In 1959, Whiteley entered four paintings to be considered for the Italian Government Travelling Art Scholarship for 1960. These works were 'Abstract autumn’, 'Dixon Street’, 'July’ and 'Around Bathurst’, which won him the scholarship. The exhibition of finalists was held at the Art Gallery of New South Wales and judged by Russell Drysdale. At the end of 1960, Whiteley moved to London, where he was primarily based for the next seven years. 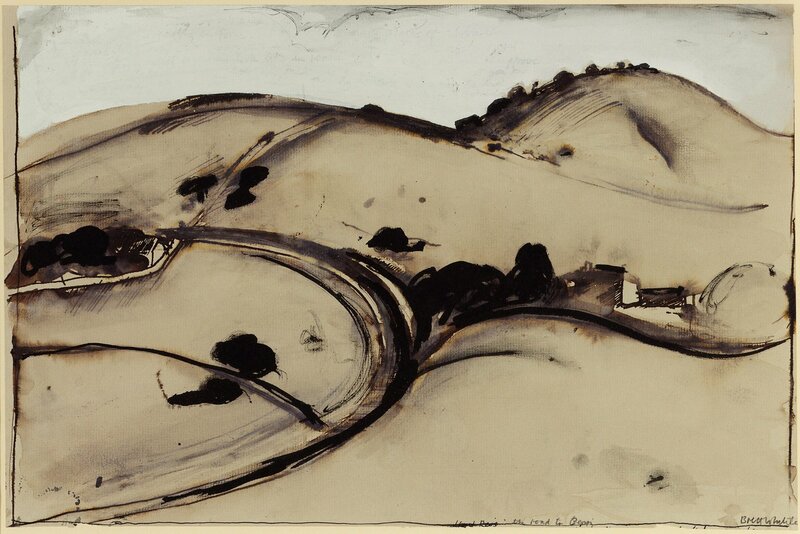 His work during this period combined the earthy colours of Australia and the ambience of Italian painting and architecture – with powerful hybrid forms of landscape and the female torso. Three Whiteley works shown in a group exhibition titled 'Recent Australian painting’ (June–July 1961) at the Whitechapel Gallery created a sensation, with the Tate’s purchase of 'Untitled red painting’ 1960 establishing the artist’s international reputation. Whiteley was 22 years old. 'To Yirrawalla’ is a tribute to the artist Yirawala (1903-76) from the language group Kuniniku language group of the Arnhem region. Whiteley felt a strong affinity upon meeting him in Sydney in 1971 and viewing his bark paintings. The minimal atmosphere of 'To Yirrawalla’ conjures up a late winter scene in a paddock somewhere in the New South Wales central west. The desiccated landscape appears to barely sustain life, apart from tiny birds, insects and exotic blue vegetation. Surprisingly, the stream running through the lower portion of the picture harbours a life-sized platypus – a favourite hybrid creature of Whiteley’s that is perfectly adapted to its demanding environment. The artist’s deft deployment of stones, a tree branch and collage all play a part in activating or heightening visual intrigue. 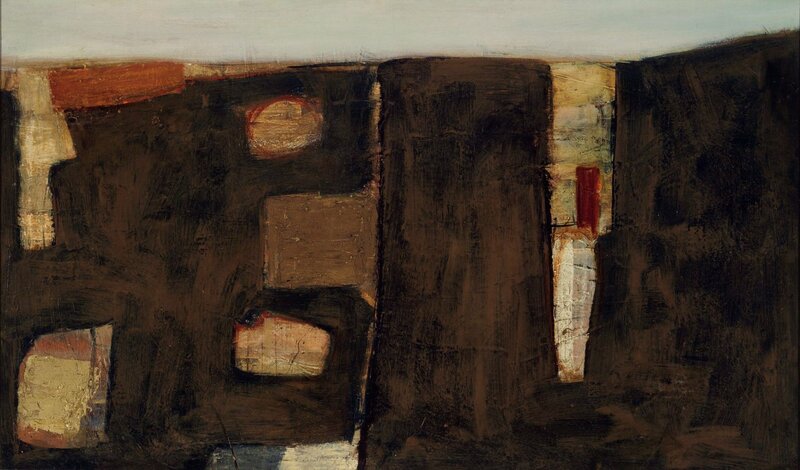 The only hint of modernity in the landscape is a bitumen roadway meandering through the top left corner of the painting. 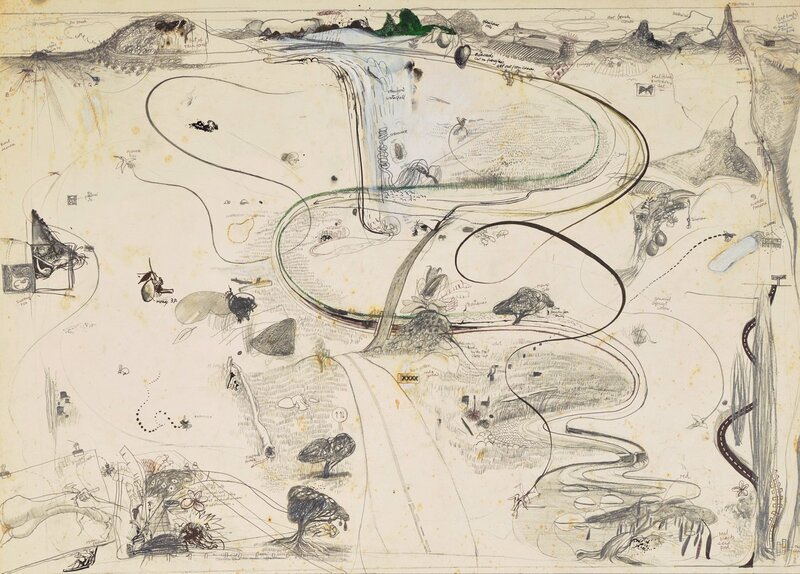 From the tiniest sketches of rocks and rivers, insects and birds, to his most grandiose vistas of land, sea, sky and cloud, Brett Whiteley has demonstrated an intimate fascination with the minutiae of nature’s mysteries and their relationship to a universe of cosmic proportions. Few Australian artists have come near the boldness with which he explored an almost impossible combination of these extremities. This drawing is a homage to Lloyd Rees’s oil painting 'The road to Berry’ 1947 in the Art Gallery of New South Wales collection. Rees painted 'The road to Berry’ in Gerringong, on the south coast of New South Wales. 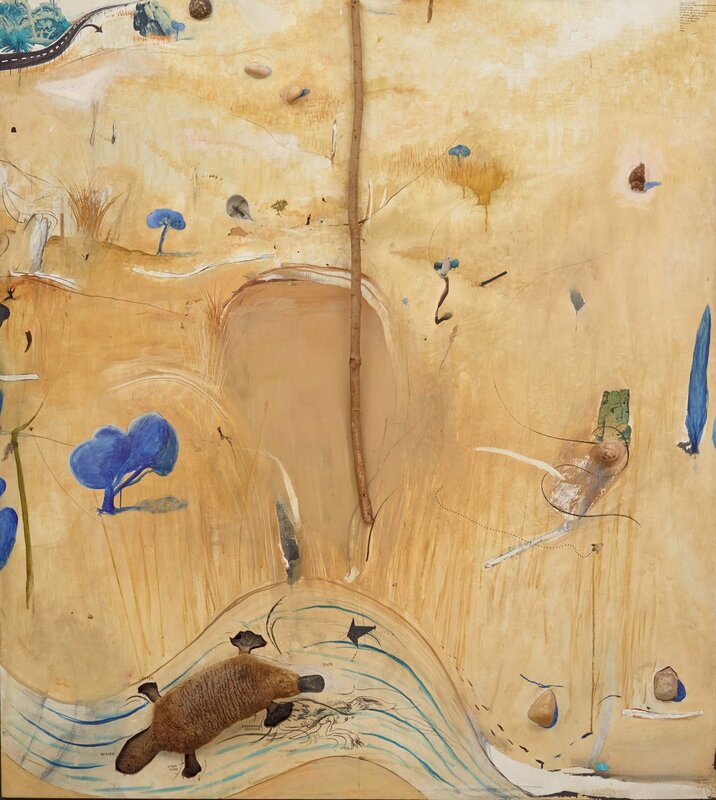 The painting came to have special significance to a number of younger artists, including John Olsen and Brett Whiteley. 'The road to Berry’ is a tiny picture I remember painting from under a copse of trees … and I just remember a small canvas and a sort of rhythmical movement that just happened; I was always amazed at the attraction it had … I was never able to repeat that little picture, and that’s a good thing. 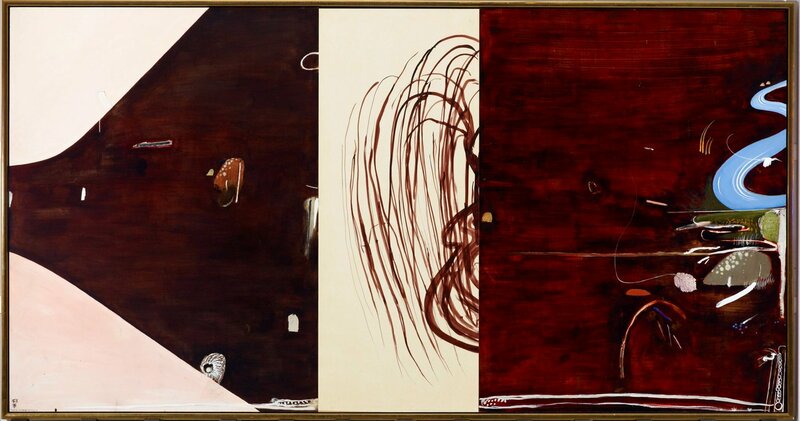 Besides a handing over of tradition, both Lloyd Rees and Brett Whiteley felt intuitively that there was a deep bond, an affinity between them: a sharing of interest and experience. One quality which they shared was a great passion and interest in drawing. They were both at their very best as draughtsman. Despite the similarities, the essential difference between Rees’s and Whiteley’s drawings is that Rees’s are what we might call classical and reveal a sense of order and structure, while Whiteley’s are romantic, two-dimensional and very dependent on gesture. Rees’s belong to a period when drawings were small, intense, private; Whiteley’s to a period where significance was measured in size in a world of immense canvases. At their best Whiteley’s drawings are magnificent performances of confidence, concentration and intensity but they are made as public, rather than private statements. For Rees, drawing was a spiritual exploration, and he was sufficiently seeped in the classical tradition to understand and value the importance of light in his work. ... anything that is beautiful is a unique mixture of abstraction, realism and expressionism: if one is neglected or overdone, if one is not considered in the light of the other, if in fact the three forces are not felt as one, in one brilliant flash of a glimpse – inspiration will be missing, and eventually meaning. 'Autumn (near Bathurst) – Japanese Autumn’ 1987-88 was begun in anticipation of his first visit to Japan in the Autumn of 1988 and probably completed upon his return, atriumphant conflation of time, place, space and simplicity. Imagine walking through Sofala. List the local features depicted in 'Sofala’ 1958 by Whiteley. Now imagine walking through 'To Yirawalla’ and 'Autumn (near Bathurst)’. How is your journey different? Write a letter to a friend describing your experience in each. 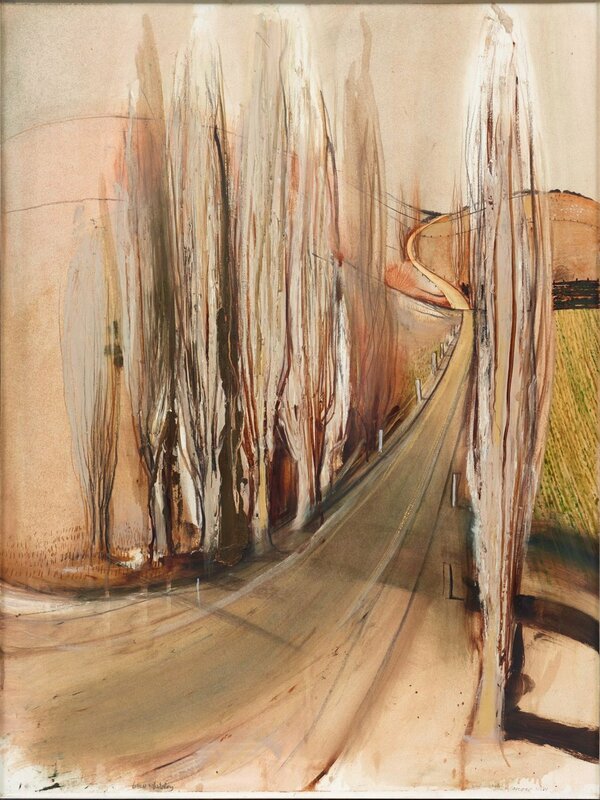 Look at the different lines and mark-making approaches that Brett Whiteley uses in these landscapes. Some are strong and thick, others are fragile and light, and some are in-between. Record all the different types of lines in a sketchbook and use them to draw the landscape that surrounds you. Imagine flying over one of these landscapes and describe how the colours make you feel. Research landscapes by the artists Russell Drysdale and Lloyd Rees and compare these to Whiteley’s landscapes. How are they similar and how are they different?